I am so glad to have finally gotten my hands on one of Target's beauty boxes, since they always sell out very quickly. I paid $5 for this box-awesome deal. And it contained a generous assortment of beauty products, a card with brief product descriptions, and a coupon that can be used towards a Target beauty purchase. 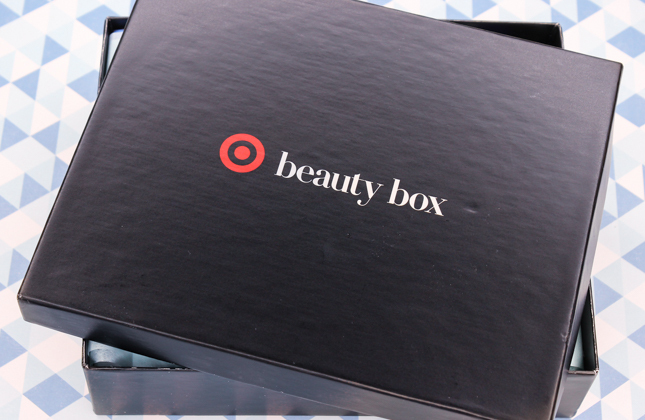 This box was a total hit with me and I can't wait to see what Target has in store for their next beauty box! You Are Amazing Juicy Grapefruit Body Lotion: I have to admit, I am not the biggest fan of products with grapefruit fragrances, but I am really liking the citrus scent in this body lotion. It's not too overwhelming, and it totally makes me long for the summer months. This body lotion moisturizes very well, and it's free of parabens, phthalates, and not tested on animals. Caress Adore Forever Body Wash: This body wash contains fragrance release pearls, a technology that's activated by touch, which releases a burst of perfume each time you touch your skin. Cool, huh? 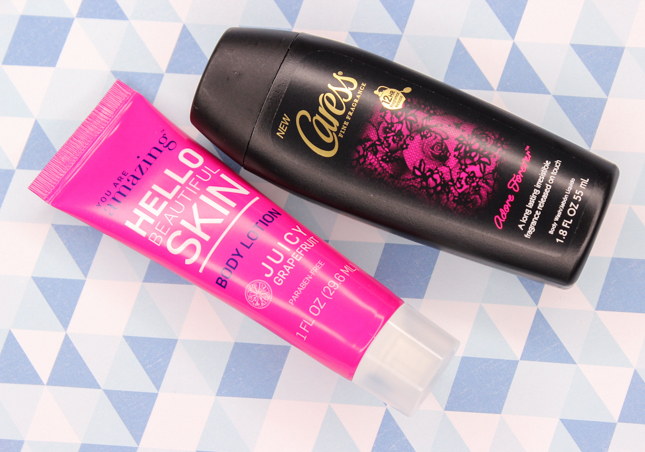 This body wash smells amazing, and I am sure it's going to be a treat using it in the shower. Banana Boat Sun Comfort SPF 30 Lotion: I can always appreciate a good sunscreen lotion. This one from Banana Boat is water resistant, lightweight, and offers broad spectrum UVA and UVB protection. Love! 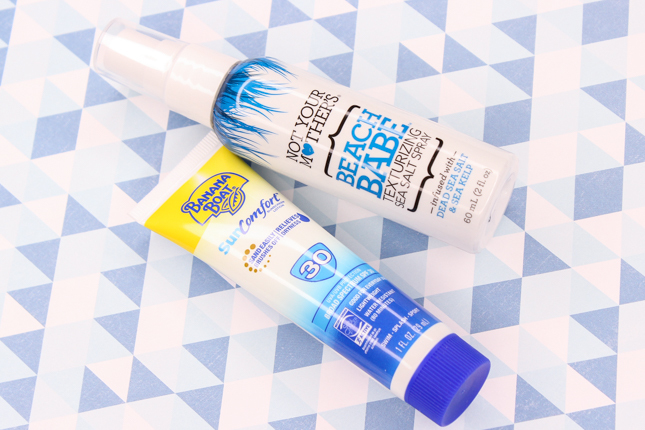 Not Your Mother's Texturizing Sea Salt Spray: I don't normally use sea salt sprays on my hair since the wavy beach look isn't a hair style I go for. But I am willing to give this one a try. It's infused with natural dead sea salt and sea kelp, and helps give hair body, texture and shine for that perfect tousled beach wave look. Nugg Deep Hydration Facial Mask Treatment: I have always been curious about the Nugg face masks, so I am glad to finally have the opportunity to try one out for myself. This anti-aging one contains vitamin B3 and white tea extract to help with skin elasticity and free radical concerns. Sinful Colors Professional Nail Color: I have the shade "Lie-Lac", a pretty pastel lilac creme that's perfect for spring. It's been awhile since I last used a Sinful Colors polish but I do like them. Not only do their lineup contain a vast assortment of colors and finishes, but the formula is pretty good too. 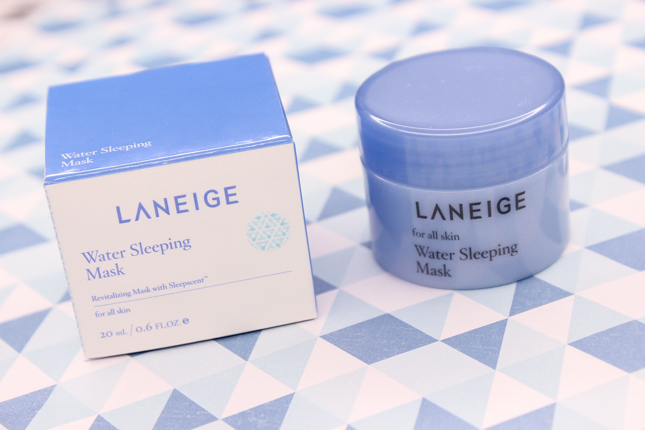 Laneige Water Sleeping Mask: This face mask helps hydrate and restore skin overnight. It contains ingredients like antioxidant-rich hunza apricot extract to brighten, and chestnut extract which helps retexturize skin. I have never used a face mask that works overnight, so it's going to be interesting to try this one. 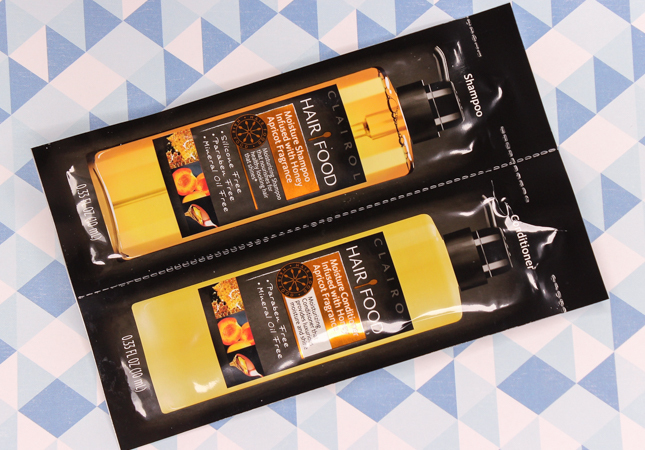 Hair Food Moisture Shampoo & Conditioner: This shampoo and conditioner duo are infused with honey apricot fragrances which help hydrate, condition, protect, and smooth hair. I love that these are paraben and mineral oil free. What do you all think of Target's Beauty box?